PNBAA works with other groups to keep on top of news and issues. Co-hosts have included the NBAA, Aviation International News (AIN Alerts), Alliance for Aviation Across America, and Pacific Rim Schedulers and Dispatchers Association. Topics have included FAA Reauthorization; Emergency Revocation of Air Carrier Certificates; Transportation Security Administration’s Large Aircraft Security Program (LASP); Safety Management Systems (SMS) resources; and dissemination of industry-specific news items. The Annual BBQ is a free and family-oriented example of PNBAA’s appreciation. Held during Seafair week at Boeing Field and when the Blue Angels’ and other air-show performers’ practice, PNBAA provides hamburgers, hotdogs, beverages and other picnic fixings for more than 200 attendees. Every September PNBAA hosts its charity golf event. Helping to keep the industry healthy, this outing targets aviation-focused benefactors including Aviation High School and the Civil Air Patrol. Members and sponsors have the opportunity to have fun and participate in supporting a worthy cause. In 2009, the event raised $3,000 for the Aviation High School (http://www.aviationhs.org/). Giving membership an opportunity to learn and share best practices is facilitated through this annual, day-long event that showcases international recognized, aerospace safety experts talking about the industry’s current and future safety issues and opportunities. This event has sold-out annually. For the 1st time publicly the events that have forever shaped the future of the air charter / management industry were memorialized when former AMI Jet Charter CEO Chuck McLeran described the October 2007 suspension and emergency revocation of AMI’s FAA Air Carrier Certificate. 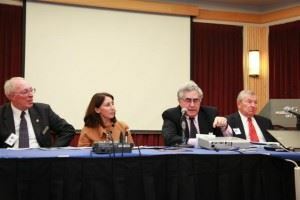 He joined an expert panel including Susan Santo, former TAG Aviation Legal Counsel; David Lehman, former FAA inspector, Gary Garofalo, Aviation Regulatory and Commercial Transaction Attorney, to discuss lessons learned with an international audience of nearly 200 attendees. Other speakers included Kevin Austin, Aero Law Group; Matthew Sheble, former executive at JetDirect Aviation (current COO of Flight Partners Group), and Roger McMullin, former Chairman of TAG Aviation Holding, S.A.
Jeff Agur of the VanAllen Group, a recognized leader in ERP services, was the MC for a panel discussion on the 2006 GOL / ExcelAire midair disaster that claimed the lives of 154 people in Brazil. Presenters included David Rimmer, ExcelAire executive and passenger on board the Embraer Legacy 600 that clipped the wing of GOL’s Boeing 737. Topics discussed included international law, public relations, insurance and lessons learned. Dr’s Larry Greenblatt, FAA AME, and Michael Jones, FAA’s Regional Flight Surgeon, discussed medical certificate issues including maintaining and regaining your medical for pilots as well as general and sports wellness for all. See attached “Trust Issue” letter from FAA’s Chief Counsel. From Jim Bennett, PNBAA President, and David D. Warner, PNBAA’s General Counsel: Earlier this month, FAA announced a retroactively effective “moratorium” on the processing of aircraft registrations for owner-trusts, where the owner-beneficiary is a non-US-citizen. A very large number of US-based operating companies, lenders and leasing companies have utilized this owner trust structure to hold title and registration for decades – statutes and rules have clearly permitted its use. Making the change retroactive could have also put existing owner-trust registrations in jeopardy. A coalition, which included the PNBAA, diligently worked to present concerns and propose alternatives to the FAA. Although the industry may continue to apply this useful registration technique, the FAA will continue to review this topic and likely will initiate an orderly review and (possibly) rule making process at some point in the future. We would like to thank the many members of a coalition of trade groups (including PNBAA), Oklahoma City title lawyers and other interested parties that came together so quickly and worked so hard to represent our aviation industry so effectively on this matter. In particular, we thank Andrea Brantner (GE Capital Aviation Services) for her outstanding leadership in spearheading the coalition’s efforts! “Calls to Action” succeed as General Aviation unifies and mobilizes to set aside the proposed WA State tax. PNBAA joins with NBAA, Members of the Aircraft Owners and Pilots Association, the Washington Pilots Association and others in the grassroots Washington Aviation Coalition (WAC). A recent NBAA Press Release includes quotes from PNBAA’s President, Jim Bennett, and PNBAA Director, Chuck Kegley. Bennett: “Legislators didn’t have a clear understanding of the true economic impact of aviation in the state of Washington. FBOs wouldn’t sell enough fuel, so their margins would get thinner and thinner. Airports would be impacted by those airplanes that moved to another state. Clearly, the impact was greater than the legislators had anticipated.” Kegley: “One voice, one message was the single driving premise for our group. Jobs, jobs, jobs. Aviation contributes immensely to the local and regional tax bases already, and any additional burden of a new tax may be enough to push these operators and aircraft owners to consider cheaper options, outside the state of Washington.” Thank you to all who reached out and spoke up! While we have now seen how effective the aviation groups in Washington State can mobilize when threatened with adversity from Legislation or other arenas, the fact remains: we were only successful in defeating the aviation excise tax increase efforts in Olympia by the slimmest of margins. We told our story well, joined the fight with the Washington Aviation Coalition (a newly restructured group of leaders from the Aviation Groups in Washington State, which also includes national representation), and fought on behalf of our state’s aviation industry with one very strong voice, thanks to all of you. During this fight, we have truly realized the need to CONTINUE to educate the state’s legislators about the aviation industry and drill into them the value of General Aviation as an essential component of the State and Local economies. OUR FIGHT IS NOT OVER AND WE NEED YOUR HELP… We still have a lot of work left to do, and we will call upon you again when the time comes to raise your voices yet again. The WA State Budget Deficit is going to be at least 3 times as high as it was last Session, and the State will be looking for avenues for funding yet again. We do anticipate another aviation excise tax proposal this session. PNBAA has been actively involved in ongoing discussions with the Governor’s office, members of the WA State Senate and State House of Representatives, and other Legislative Staff members to develop a reasonable fee-based schedule. PNBAA also proposes that any fees collected for aviation should go directly to the Washington Airports / WSDOT Aviation instead of to the State’s General Fund. Thank you, once again, for your response to our calls to action. Stay tuned for more details and/or calls to action as this legislative fight continues. If you have any questions or concerns regarding this issue or PNBAA’s overall role in government affairs, please contact PNBAA’s Chuck Kegley at chuck@reupsystems.com. The PNBAA Maintenance Committee provides aviation maintenance professionals in the Pacific Northwest Region an avenue to network with one another, expand their knowledge with training, and grow together to be a more cohesive group. This group typically meets as a group once a quarter in the Pacific Northwest region. This group is typically made up of directors of maintenance, aircraft technicians, aircraft inspectors, service providers, industry related vendors and also pilots. So far, we have conducted four PNBAA Maintenance Luncheons over the last year. The group has collectively elected to meet within some of the corporate aviation hangars based at Boeing Field Airport. Everyone likes to see the inside of some of these beautiful hangars that they usually only drive by coming to work. This format also keeps this group working on a minimal budget. Some of the contributing hangars to these luncheons have been American Avionics/Ashton Aviation, Nordstrom’s Corporate Flight Department, and Clay Lacy Aviation. With sponsors coming in as well to sponsor a luncheon, we have been able to keep all PNBAA Maintenance Luncheons completely free of charge to all participants. Some of the sponsors that we have had so far are American Avionics at Boeing Field Airport in Seattle, Global Aviation in Hillsboro, Oregon and Aircell, based in Broomfield, Colorado. As this group has progressed, many other potential sponsors are stepping up in the future to cover the costs of future luncheons. We look forward to expanding these luncheons to larger groups, as we have had growing attendance at each event, with some reaching just shy of 100 attendees. We have had many interested parties volunteer in taking part in future events. As always, these events can only take place with the involvement and participation of our members and other related participants. We welcome any feedback for future events, as well as any ideas for subject matter for future events. Obviously, the subject matter for these luncheons should relate to the day to day duties of our aviation maintenance professionals. They are meant to be informative and helpful to the understanding of current issues evolving in our industry. One other major benefit of these luncheons and various PNBAA gatherings is the obvious networking potential this presents to all participants. It seems that everyone gets involved in their day to day duties in their jobs and rarely takes the opportunity to fraternize with others that share the same job within different flight departments. Our luncheons provide the opportunity for old friends to re-unite and for new people in the area to get to know some of their neighbors. Some of these people have even been able to network through these luncheons to assist them in finding new employment, when they’ve been dealt the unfortunate hand of finding themselves out of work. Presentations for these past topics are attached in the presentations below. Please feel free to refer to these presentations for future reference, as these subjects are discussed among your flight department or company. An Update from Brad Townsend, National NBAA Maintenance Committee Chairman. Brad works as the Director of Maintenance for Sprint in Kansas City, MO. He will be making a future presentation about what’s going on with NBAA’s Maintenance Committee on a national level. An Update from Eli Cotti, who runs the Maintenance Committee of the Chicago NBAA Regional Group. We are also looking into the expansion of conducting one or more of these events in other cities in the Pacific Northwest, rather than just Seattle, as we do have participants from other cities coming to our events. We look forward to being able to branch out into different cities within the Oregon and Washington areas. Please feel free to contact Darwin Stout, PNBAA Maintenance Committee Chairman via the contact information below for any further information or to submit any feedback on how PNBAA can better serve you, our members. “I was in awe,” said Jim Bennett, president of PNBAA. Themed “The Human Side of Aviation,” the all-day regional safety event was held March 4 in Seattle’s Museum of Flight. Some 150 aviation department managers, pilots, safety officers, risk managers, directors of maintenance, schedulers and dispatchers attended, welcoming the chance to hear directly from aviation safety experts. Breakfast, lunch and all course materials were included in the $120 admission cost. Speakers at the Safety Day comprised “an all-star cast,” said Kristi Ivey, NBAA Northwest Regional Representative. They included Sean Roberts of National Test Pilot Schools; former NTSB investigator Greg Feith; United 232 Captain Al Haynes; aviation safety analyst John Nance and the originator of Bombardier’s annual “Safety Stand-Down” events, Bob Agostino. “Several aviation department managers told me they planned to send as many people as they can next year because of the value they see in the event,” Ivey added. At the Safety Day, PNBAA President Bennett and Sue Carroll also presented a check for $2,500 to students from Aviation High School, the only college preparatory aviation-themed high school in the northwest. The money came from a PNBAA-sponsored charity golf tournament held last year. NBAA’s Regional Representatives work with Members across the country on a range of local issues. These individuals are highly knowledgeable about the priorities for Members in their own region, state or city. NBAA promotes the development and growth of local business aviation organizations, as reflected in the Association’s work to support the approximately 50 local business aviation groups currently active across the country. NBAA coordinates with local business aviation groups on a host of regional airspace and air traffic policies and proposals affecting Association Members’ operations.